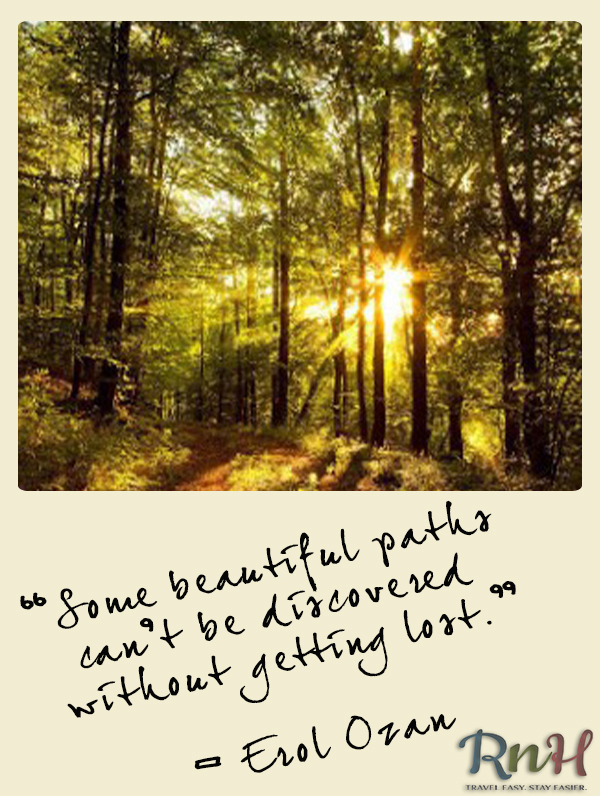 I’ve written about being lost before,(http://blog.roomnhouse.com/2014/04/a-sense-of-direction/) and this quote helped me look at the experience in a better light. Coming back to the quote, “Some beautiful paths can’t be discovered without getting lost.” – Erol Ozan, is by far the most honest representation of the truth about travel as I know it. There’s something quite enthralling about a raw off beaten, path, untainted by civilization, unharmed by human interest, untouched by the cruelty of “progress”.. there’s something about the way the sand sinks under the pressure of your foot, something about the air as it grazes your being, something about the view – it can never compare to anything you’ve ever seen so far. All this being missed out on, simply because we didn’t think too much to break away, or because we were too scared to get lost. So many secrets waiting to be uncovered, in broad day light, simply wait in the shadows, because we’re too afraid of what we might find, rather than focusing on what we will find. What we might find would be trouble, but what we will find, is an adventure filled with moments that will take our breath away. Travel more and get Lost more often.